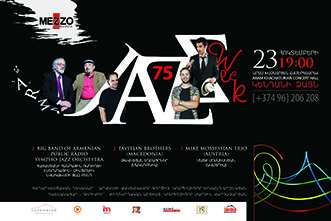 Celebration of “ARM JAZZ WEEK – 75” was held in the Capital of Armenia from October 23 – 30, 2013. Gathering the jazz musicians with Armenian roots from all around the world together with our famous musicians and celebrating the birth of our jazz was the core of this project. The week began with a gala-concert at the Philharmonic Hall on October 23 with participation of the main musicians of the event – Tavitjan Brothers from Macedonia, the Austrian singer Mike Mossiessian with his trio and Sympho-Jazz Orchestra of the Public Radio of Armenia directed by Yervand Yerznkyan. During the whole week in “Mezzo Classic House-Club”, not only musicians from Macedonia and Austria, but also our local jazz musicians, namely Chico & Friends, “Nuance” ethno-jazz, Marine Hakobyan and “Free Form” jazz band, Simon Dolmazyan, pleased the audience by their skills. Yervand Yerznkyan and Martin Vardazaryan became the favorites of the final musical evening. This project was, certainly, a great startup for the revival and preservation of traditions for future generations.